“Is it my fault that I don’t have a nationality?” a young Nepali girl asked recently on one of the country’s prime-time talk shows. “No it is not. It is your mother’s,” replied the male authority figure. The girl is one of countless women, men, girls and boys in the country who are classified as stateless, despite being born in Nepal to Nepali mothers. Nepal remains one of twenty-six countries that denies women the equal right to confer nationality on their children, and one of roughly fifty that denies women the right to pass nationality to their spouses and to even acquire and retain their own nationality. We recently travelled to the country, on behalf of the Global Campaign for Equal Nationality Rights to increase government authorities’ and legislators’ awareness of the significant harm done by this discriminatory nationality law to individuals, families, and indeed to the country’s economy and reputation. We witnessed a country striving to write a new chapter marked by stability and a shared prosperity. Ten years after its historic peace agreement, one year after the establishment of its new Constitution, and still recovering from the devastating 2015 earthquake, this young democracy is considering how to lay the foundation for a fairer society that transcends the political conflict and economic hardship of the past. Like too many countries though, it is trying to do so having tied one of its own hands behind its back. The impact of gender discrimination in nationality laws is significant and wide-ranging: from denied access to education and healthcare, to the inability to own property, hold a bank account or drivers license, vote, or run for public office. Many end up statelessness, not considered citizens by their own countries, or indeed, any other country in the world. Denied equal rights, the child of a Nepali woman whose father is ‘unknown’ (a term with great stigma attached) should, according to the Constitution, have access to citizenship. In practice, such children can only apply for naturalized citizenship – which is citizenship not by right, but at the discretion of state authorities, most of whom are deeply conservative. The child of Nepali woman and a foreign man may only apply for naturalized citizenship if the child has not acquired any other citizenship and is a permanent resident of Nepal. Even when it comes to securing one’s own citizenship, Nepali girls must do so through their father and married Nepali women through their spouse. This year, laws that conflict with the new constitution, including the nationality law, are expected to be amended. This presents an opportunity to advance the nationality rights of Nepali women and their children in some circumstances – an opportunity that, if leveraged, would benefit the country and further gender equality. 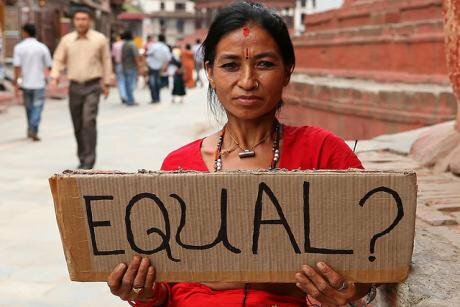 However, to achieve equal nationality rights for Nepali men and women, a Constitutional amendment is urgently needed. “If my daughters become refugees in another country, will they then be able to get a nationality?” This was the question being asked by Deepti Gurung, a Nepali woman unable to secure Nepali nationality for her children born in Nepal, despite trying everything possible for many years. That an educated woman would even fleetingly consider refugee status in a foreign country as a ‘solution’ to securing her children’s future, points to a profound sense of helplessness. When we visited Deepti and her family, sitting in her living room and eating her expertly made samosas, we could feel the deep sadness, frustration, and desperation of this mother who would do anything to give her daughters the opportunity to succeed in life. She knew that, despite all her efforts, the list of opportunities that her daughters would be denied was long and the burden heavy. When speaking with her daughter, what struck us was not just that here was an intelligent young woman who would never become the doctor she dreamt of being, or whose plans to be a lawyer were indefinitely put on hold until she got citizenship. Here also was a country heavily dependent on its next generation, but missing out on some of its best and brightest young talent due to an ill-conceived and discriminatory law that most countries have relegated to the history books. Though ‘lucky’ is never a word Deepti would use to describe her family’s situation, many affected families face situations that are far more dire. Sapana Pariyar's husband abandoned her and their two children, refusing to grant his citizenship to his wife or daughters. Single mothers who were married before applying for citizenship have little chance of securing theirs or their children's. Lacking the documents needed for formal employment, Sapana does hard labor to try to put enough food on the table for her children. The meager salary was not enough, however, to pay primary school fees or rent in their modest home. As a result, the family is homeless and the two young daughters cannot go to school. The personal cost of statelessness is well-documented and wide-ranging, but states are not necessarily motivated into action by this alone. However, the cost of statelessness is not only individual. States also pay a price: an opportunity cost of a growing disenfranchised population with no means to support itself or contribute to the formal economy; the development cost of not being able to benefit from the full potential of all its people; the socio-political cost of ever-increasing inequality and tension. The link between gender equality and sustainable economic development is not groundbreaking. Development experts and human rights actors have emphasized the connections for years. That is why the Sustainable Development Goals (SDGs) include ending discrimination against women as a stand-alone goal (Goal 5), while also integrating gender indicators throughout the other sixteen goals. Nepal and countries with similar laws will not be able to reach targets on nine of the seventeen SDGs, as long as they retain gender-discriminatory nationality laws. These include targets related to achieving peace, justice and strong institutions (Goal 16), quality education (Goal 4), the eradication of poverty and hunger (Goals 1 & 2), and the reduction of inequalities (Goal 10). We have all been patriarchal societies and continue to be, to varying degrees. No country has a monopoly on that history. But it is a legacy that is holding every country back – notably so when gender discrimination is sanctioned by law and prevents access to citizenship. Discriminatory nationality laws provide insight into the state’s position that despite whatever else is written, rights and responsibilities are ultimately defined (and denied) by gender. They show that all citizens are really not equal before the law. Nepal will be drafting a new citizenship law in the coming year. Like other countries with discriminatory nationality laws, it will also be establishing a national action plan to realize the Sustainable Development Goals. And so, well into the 21st century, it has a dual opportunity to finally end one of the great exclusions of the 20th century and to set its course on the path to equality, justice, and sustainable development for all. For the sake of its people, its future, we can only hope that this is an opportunity it will take.